I hope you like my outfit for today? As you can see the pink color predominates Actually, D&G skirt inspired me to look for clothes that match it. That’s why I chose the pink jaket blazer from Motivi, Mango shirt and Braccialini bag. By the way the black bow on the Mango shirt looks so lovely and I’ve always wanted it in my wardrobe. Now I’ve got it I’m glad because it also gives an air of elegance to any outfit. 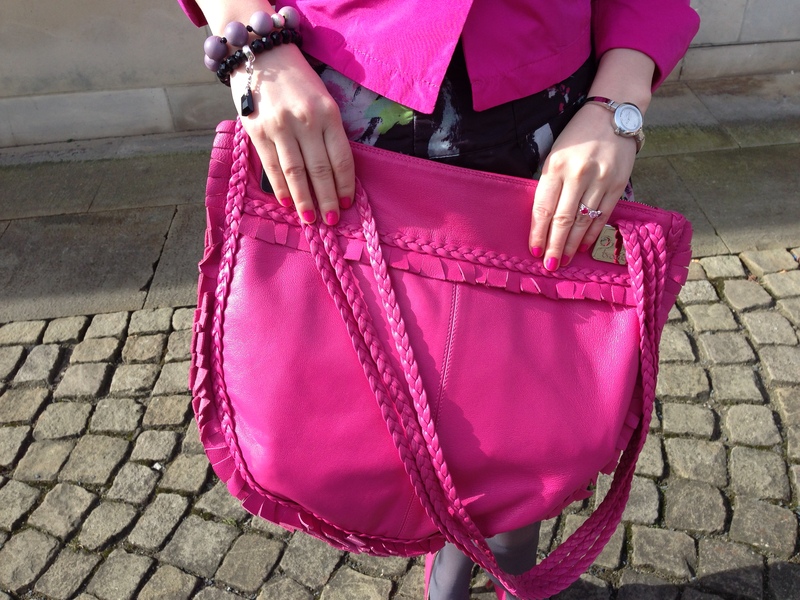 Thanks to Braccialini my collection of handbags has a nice pink bag. In fact, every time I had the opportunity to wear this bag I always replaced it with another one, because the strap was too long for me. So it was really uncomfortable to use it. Until one day when I finally had more free time and I decided to cut it out. I’m glad that I could finally wear my Braccialini bag. So if you have something that doesn’t fits you well and you like it a lot, then do not hesitate to cut, add, change etc. Give new life to the things that are forgotten in your wardrobe!!! If you are afraid that you won’t manage then go to a tailor and I’m sure she’ll help you. Of course, I couldn’t forget about my Murano Glass bracelet that I bought last year in Venice. The bracelet is made of glass that is produced on the island of Murano in Venice. I wish you a beautiful day my dears!!! !